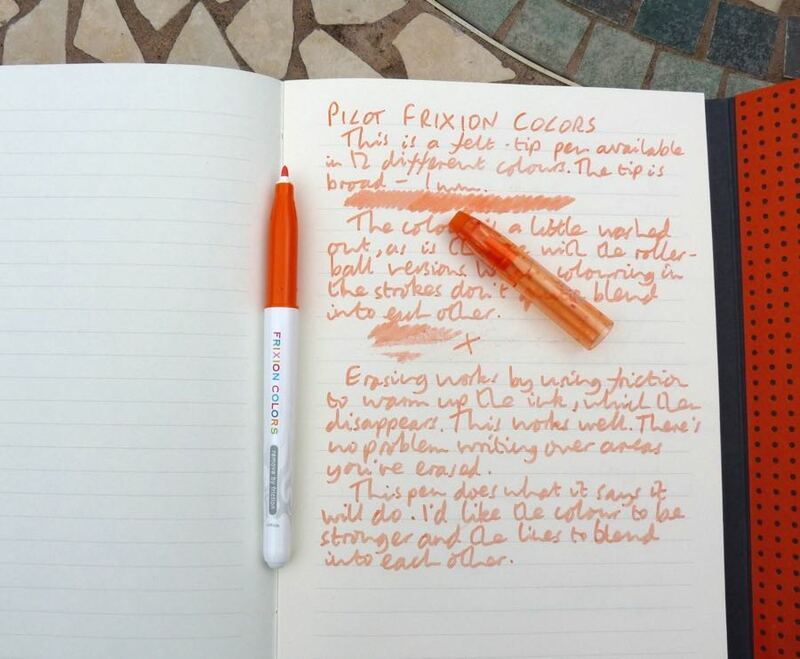 Pilot Frixion Colour Pen review – Pens! Paper! Pencils! When I was at school, many many moons ago, I remember how an erasable pen felt like some kind of holy grail. We had to write in pen, we made many many mistakes, and we wanted to obliterate all those mistakes so our teachers would never see. All we got, though, were pens with granite-like erasers that removed the ink by rubbing away all the paper the ink was sitting on. No good at all. Over the years many companies have tried to perfect the erasable pen and Pilot, I think, have come the closest to getting something that’s useful with their Frixion rollerball. This Colours pen is an attempt to make an erasable colouring pen using the same technology. 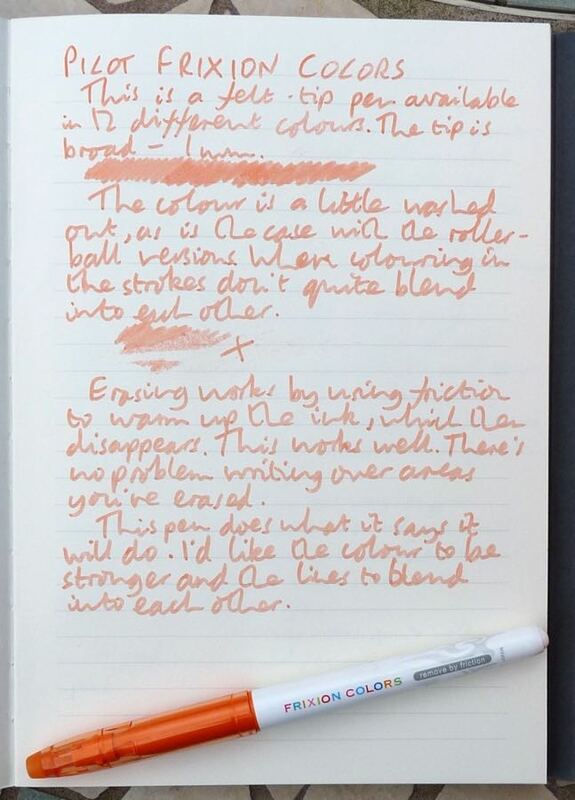 The pen itself looks quite nice, with a white plastic barrel featuring a subtle grey swirl pattern, a small barcode, ‘Frixion Colours’ misspelled in different colours and ‘remove by friction’ in grey. 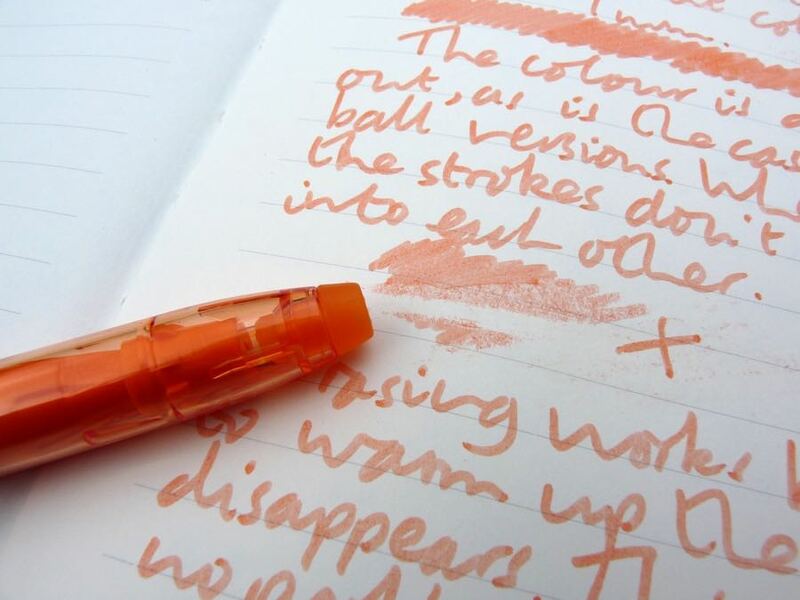 The long grip section is the same colour as the ink, as is the translucent cap. All in all the result is a pen that looks fun and modern. The cap has an inside piece to seal the tip and stop it from drying out. I’ve had this pen quite a while and this seems to work very well. The cap posts deeply and has a little sticky out piece to stop your pen from rolling away. The pen’s very light and so the balance isn’t affected by posting. It’s a good length posted or not. The ink colour is a little washed out. 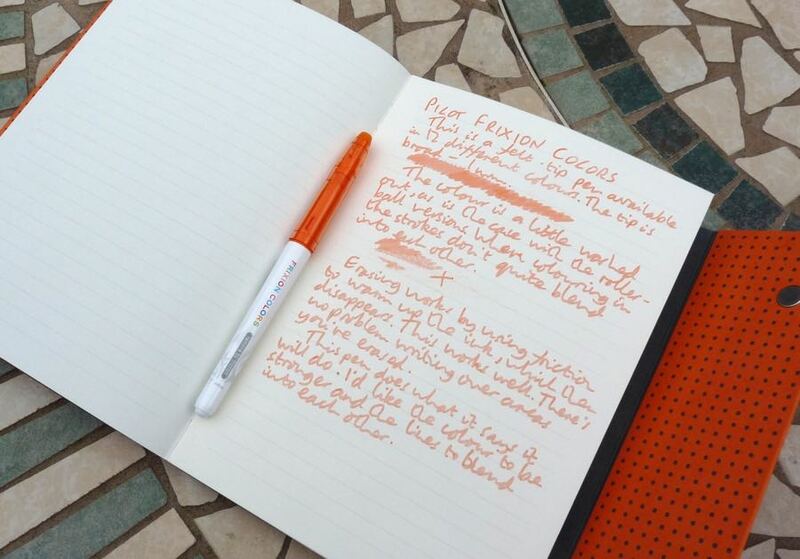 The Frixion rollerball pens suffer from the same problem. Also, when you’re colouring in an area it’s very hard to achieve a smooth effect: you can see each stroke. 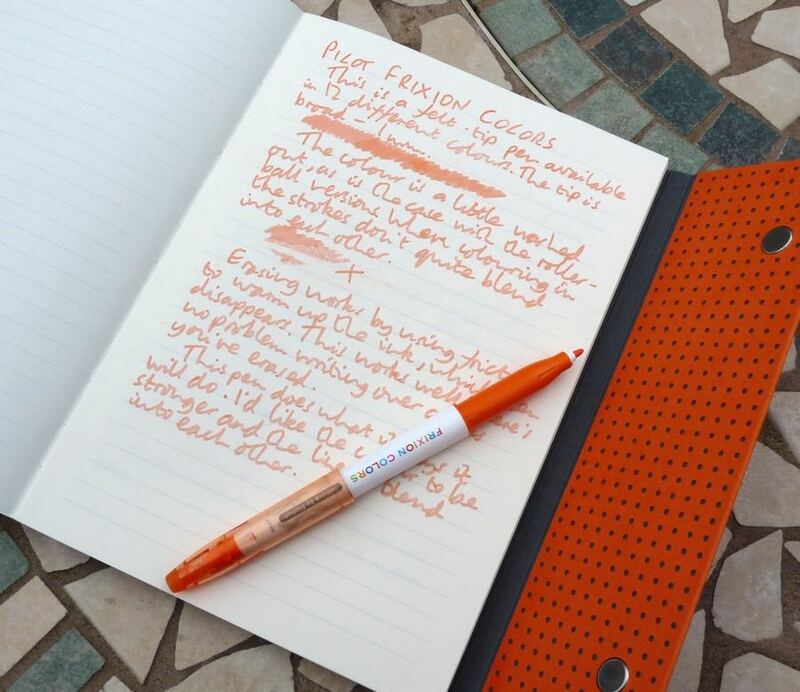 Frixion pens work by using friction to heat up the ink and make it disappear. Putting the paper in an oven would have the same effect. Putting it in a freezer makes it all come back. There’s an eraser on the end of the cap, which is much more convenient. It works extremely well. You can also write back over areas you’ve erased without any ill effects. I would like the colour to be stronger and for the strokes to be less obvious but this is a felt tip pen that you can erase. That’s pretty amazing.